When you reach Mantua along the road that skirts the lakes of the Mincio River, the view will seem like a hologram. The distant, haze or mist-shrouded city is a fairy tale scene, its blurred edges wrapped in a dreamlike dimension. Mantua is an elegant cultured city whose streets and ancient buildings exude art and beauty, inherited from the Gonzaga dynasty and, probably, from a natural vocation for beauty – it's no coincidence that Mantua was the home of Virgil and Mantegna and the exceptional setting for Verdi's opera Rigoletto. 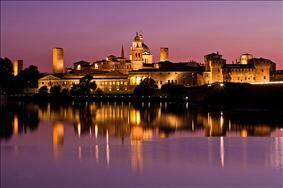 It can be said without fear of contradiction that Mantua is one of the most romantic cities in Italy. Just take a walk through its charming squares: Piazza delle Erbe, Piazza del Broletto and Piazza Sordello. Stop at the Cathedral, decorated with stuccowork by Giulio Romano, and visit the basilica of St. Andrew, designed by Leon Battista Alberti. But the emotional high point has to be the famous Wedding Room, painted by Mantegna in the Ducal Palace for Ludovico Gonzaga and his family: a magnificent interweaving of people, animals and landscapes alternating with exceptional examples of trompe l'oeil. In a more isolated location is the famous Palazzo Te, designed by Giulio Romano in the 16th century for the Gonzaga family, and containing artistic masterpieces such as The Hall of Giants and the Hall of Cupid and Psyche. Not far from Mantua is the town of Virgilio, renamed in 1883 in honour of the great Latin poet. A museum dedicated to him offers, among other things, an itinerary illustrating his life and works together with a precious example of Renaissance ceramics. Just four kilometres from Mantua is Porto Mantovano, where you can visit the elegant Villa La Favorita, a fabulous construction and one of the Gonzaga family's most important buildings due to its range of columns, balconies, windows and architectural motifs. Less than thirty kilometres from Mantua is the small town of Cavriana, known for its monumental castle where Francesco Gonzaga died in 1407. Only part of the outer walls and the bell tower of this imposing building still stand; the remaining walls were used to build the 16th-century Villa Mirra, also a Gonzaga family possession and now home to numerous cultural and artistic events. Another of Mantua's gems, San Benedetto Po, is linked to the name of Matilda of Canossa. We suggest a visit to the abbey church, a splendid construction the countess donated to the pope after the famous incident between Emperor Henry IV and Pope Gregory VII that took place at Canossa. To conclude this exploratory tour of Mantua and its treasures, we propose a particular gem: Volta Mantovana. Despite its small size the town has an artistic heritage of great importance, starting with the splendid Gonzaga Palace, the family's country residence with magnificent frescoes and a luxuriant garden. Next is the ancient parish church dating from 1037, containing 15th-century frescoes and a beautiful 18th-century altar. And to finish, let's not forget to stop and taste the delicious Mantua cuisine, full of superlative flavours rooted in countryside tradition. For connoisseurs, there are pumpkin tortellini with their characteristic sweet-and-sour flavour; for the most demanding palates tagliatelle with wild duck sauce; and for the sweet-toothed, the classic sbrisolona (crumbly) cake. To make visiting all these locations easy, the ideal accommodation for your vacation is undoubtedly one of the comfortable agritourisms in the province of Mantua, where you can fully enjoy the splendour of an area graced with the elegance and lasting beauty that only great dynasties can leave to posterity. On Mantua's Lake Superior during the summer months you can enjoy the sight of a floating island of lotus flowers. According to legend, a young man on a trip to the East met a beautiful girl with almond eyes and skin that smelt like lotus flowers. The couple came to Mantua, but the girl drowned while looking at her reflection in the lake. The anguished youth scattered lotus flower seeds in the water so that every summer they would bloom in memory of his lost love.